An Expedition 22 crew member onboard the International Space Station took this image of the 260-year-old city Port-au-Prince on Jan. 18, 2010. This was a few days after the major Haitian earthquake brought devastation to Port-au-Prince, Carrefour, and the surrounding region. The photo was taken with an 800 mm lens setting. Astronauts aboard the International Space Station recentlyphotographed Haiti from orbit in the days following the country?s devastatingearthquake. 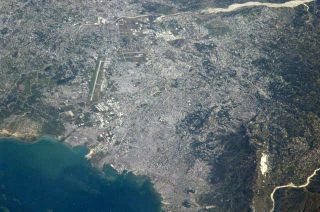 The images revealed the damage that has occurred in theaftermath of the massive Jan.12 earthquake that struck near the island nation's capital, Port-au-Prince.The space station flew over the 260-year-old city Jan. 18, giving the station'sExpedition 22 crewmembers a chance to snap photos of the hard-hit region. Taken from the space station 220 miles (354 km) above Earth,the images show some of the destruction, as well as the mighty relief effortsunderway. The Toussaint Louverture International Airport, clearly visible onthe north side of Port-au-Prince, is the main hub incoming international aid.The photos show the airport's single runway and control tower, which washeavily damaged by the 7.0 magnitude quake, but has since been rebuilt. The images also show the Port-au-Princeharbor, with clearly visible ships, which has also been a focal point forincoming aid. A wider view, taken last year, shows the whole island ofHispaniola, which Haiti shares with the Dominican Republic. The space station is currently home to five spaceflyers: twoRussians, two Americans, and one Japanese astronaut. NASA astronaut JeffreyWilliams commands the Expedition 22 crew, which also includes Timothy (T.J.)Creamer, also of NASA, Russian cosmonauts Maxim Suraev and Oleg Kotov, andJapan Aerospace Exploration Agency spaceflyer Soichi Noguchi. Last week, Noguchi sent condolences from the entire stationcrew to the Haitiearthquake victims.